"So it looks like he was raped, stupid!" Appropriately enough, I guess you could say zombie movies have been done to death by now. In fact, there have been so many of them that there are practically sub-genres within it now. One of these is the sort of weird, quirky films that focus on the zombie itself as a character; whereas most zombie films portray them as antagonistic hordes to get mowed down by shotgun blasts, films like Fido and Colin take the opposite approach. Into that same tradition steps Melvin, who also represents the nerdy sector of the undead in this bloody tale of revenge. Like so many unfortunate geeks in horror movies, Melvin (who probably weighs in as a 98-pound weakling) falls victim to a prank at the hands of bullies. In this case, it’s fatal; no problem though, because he’s able to come back as a zombie…and a ghost? At any rate, he makes contact from beyond the grave with another nerd named Norton and basically uses him to get revenge on those who killed him…and even some random people who didn’t! This is one of those films where it’s obvious that everyone involved has seen a bunch of cult movies in their time and have been inspired to pick up a camera because of it. You’ll find all kinds of references to stuff like Army of Darkness and even Shaft; however, it’s most obvious that these guys and gals have spent a lot of time in Tromaville because that’s where it feels like Melvin strolled in from. If the title character’s name wasn’t enough of a call-back, one of the characters wears a Toxie shirt just to make sure you got it. To hammer the point home, Lloyd Kaufman himself shows up as the title character in Night of the Driller, a movie that the characters watch (on VHS, of course!). These two segments are an especially fun homage to Driller Killer and come complete with Grindhouse-style faux scratches, pops, and over-the-top bloodhsed; it’s absolutely gratuitous and only serves an excuse to reference other junk these guys love, but it works well. Melvin also shares many of the flaws of some of the films that inspired it, such as spotty acting and a fairly weak script that doesn’t do a whole lot of interesting things with its characters. It sort of tries though, and the movie might surprise you a bit because it’s got a lot more in common with American Werewolf in London than it does any zombie flick. I say this because Melvin appears to Norton the same way Jack visits David in American Werewolf; the only problem is that there really isn’t enough time spent establishing the two. The movie does some weird, sort of confusing things with its narrative, as it jumps back and forth in time with reckless abandon before you kind of figure out what’s up. This sort of results in the whole thing being a sequence where the three “good” characters (Melvin, Norton, and Melvin’s sister) constantly clash with everyone else, who can be separated into two categories: doofuses and assholes. As such, you’re really just waiting to see the former take revenge on the latter. 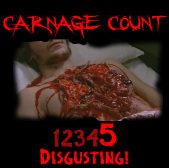 And it is admittedly some glorious, gory comeuppance with some great splattery effects. Most zombie films are content to have the undead chew up their victims, but it’s almost like they turn into the T-800 here, as the undead practically plow through the living. Principal Richard “The Bull” Vernon never dreamed of cracking skulls so viciously. Before I completely misrepresent the film as a simple exercise in gore, I should also note that it’s a pretty stylish one that boasts some pretty decent production values. It just would have been nice to see the film do a bit more--I think there was room to make an awesomely poignant Revenge of the Living Dead Nerds type flick had they gone that route; instead, the movie is just an hour long romp that either feels like an unnecessarily padded short or an undercooked feature. But I guess that’s probably okay too--after all, this is the type of movie that could easily wear out its welcome. It’s obviously crass and exhibits little in the way of good taste, so be prepared. It’s been on the festival circuit for some time and has seen one DVD release already, but Chemical Burn is bringing Melvin home again with a new release this June. The screener provided me boasted a nice transfer and soundtrack, plus an introduction from Kaufman just like the one’s you’re used to seeing on Troma DVDs. I’m not so sure how Troma didn’t end up with this one themselves, but it’s to Chemical Burn’s benefit because this is easily the best film I’ve seen from them so far and is definitely worth a look. Rent it!